Anti-Shi'ism is the prejudice, hatred of, discrimination or violence directed against Shia Muslims because of their religious beliefs, traditions and cultural heritage. The term was first defined by Shia Rights Watch in 2011, but has been used in informal research and scholarly articles for decades. The dispute over the right successor to Muhammad resulted in the formation of two main sects, the Sunni, and the Shia. The Sunni, or followers of the way, followed the caliphate and maintained the premise that any member of Quraysh could potentially become the successor to the Prophet if accepted by the majority. The Shia however, maintain that only the person selected by God through the Prophet (Hadith of the pond of Khumm) could become his successor, thus Imam Ali became the religious authority for the Shia people. Militarily established and holding control over the Umayyad government, many Sunni rulers perceived the Shia as a threat – both to their political and religious authority. The Sunni rulers under the Umayyads sought to marginalize the Shia minority. The persecution of Shias throughout history by Sunni co-religionists has often been characterized by brutal and genocidal acts. Comprising only around 10% of the entire Muslim population, to this day, the Shia remain a marginalized community in many Sunni dominant countries without the rights to practice their religion freely or to become established as an organized denomination. The grandson of Muhammad, Imam Hussein, refused to accept Yazid I's rule. Soon after in 680 C.E., Yazid sent thousands of Umayyad troops to lay siege to Hussein's caravan. During the Battle of Karbala, after holding off the Umayyad troops for six days, Hussein and his seventy-two companions were killed, beheaded, and their heads were sent back to the caliph in Damascus. These seventy-two included Hussein's friends and family. The more notable of these characters are Habib (Hussein's elderly friend), Abbas (Hussein's loyal brother), Akbar (Hussein's 18-year-old son), and Asghar (Hussein's six month old infant). On the night of Ashura (which is called Sham-e-Gharibaan), the army of Yazid burned the tents which Hussein's family and friends had lived in. The only occupants of the tents after the war were the women, children, of Hussein's companions along with Hussein's last ill son named Zain-Ul-Abideen (who became the next Imam after Hussein). During the raid, Yazid's forces looted, burned, and tortured the women and children. They then took the heads of the martyrs, planting them on spearheads to parade. The women's shawls and headdresses were also stripped and they were forced to march beside their men's heads all the way to Damascus. They stayed in prison there for about a year. While Imam Hussein's martydom ended the prospect of a direct challenge to the Umayyad caliphate, it also made it easier for Shiism to gain ground as a form of moral resistance to the Umayyads and their demands. There was also the Umayyad tradition of cursing Ali. After the Mongol sack of Baghdad in 1258, prejudice against Shias became more frequent, reminiscent of blaming Shias for every problem. In response to the growth of Shiism, the Ottoman Empire killed Shias in Anatolia. Hundreds of thousands of Shias were killed in the Ottoman Empire, including the Alevis in Turkey, the Alawis in Syria and the Shi'a of Lebanon. In the past Shias in India faced persecution by some former Sunni rulers and Mughal Emperors, resulting in the death of Indian Shia scholars like Qazi Nurullah Shustari (also known as Shaheed-e-Thaalis, the third "Martyr") and Mirza Muhammad Kamil Dehlavi (also known as Shaheed-e- Rabay, the fourth "Martyr") Qutubuddin Shaheed, also spelled Qutbkhan Qutbuddin, Ahmedabad, India was the 32 nd Da'i al-Mutlaq of the Dawoodi Bohra sect of Musta‘lī Islam. He succeeded the 31st Dai Kasim Khan Zainuddin who are three of the five martyrs of Shia Islam. Shias also faced persecution in India in Kashmir for centuries, by the Sunni invaders of the region which resulted in the killing of many Shias and as a result most of them had to flee the region. Shias in Kashmir in subsequent years had to pass through the most difficult period of their history. Plunder, looting and killing which came to be known as ‘Taarajs’ virtually devastated the community. History records 10 such Taarajs also known as ‘Taraj-e-Shia’ between 15th to 19th century in 1548, 1585, 1635, 1686, 1719, 1741, 1762, 1801, 1830, 1872 during which the Shia habitations were plundered, people killed, libraries burnt and their sacred sites desecrated. The community, due to their difficulties, went into the practice of Taqya in order to preserve their lives. Villages disappeared, with community members either migrating to safety further north or dissolving in the majority faith. The persecution suffered by Shias in Kashmir during the successive foreign rules was not new for the community. Many of the standard bearers of Shia’ism, like Sa’adaat or the descendants of the Prophet Mohammad and other missionaries who played a key role in spread of the faith in Kashmir, had left their home lands forced by similar situations. During Aurangzeb's rule, many Shia Muslims from North Karnataka had to leave their cities to save themselves. They settled in Bangalore, Mysore, Alipur, Karnataka and other southern cities. Present day India is a secular state and adherents of Shia Islam in India are free to practice their faith freely. Additionally the day of Ashura, listed as Moharram, and the birthdate of Ali are recognized as public holidays. However Shias Muslims in Kashmir are not allowed to practice mourning on the day of Ashura. The state government of Jammu and Kashmir has placed restrictions over Muharram processions which is seen as opposite to the right to freedom of religion that is fundamental right of Indian citizens. Every year clashes take place between the mourners and Indian guards on the eve of Karbala martyrdom anniversaries. Most foreign slaves in Xinjiang were Shia Ismaili Mountain Tajiks of China. They were referred to by Sunni Turkic Muslims as Ghalcha, and enslaved because they were different from the Sunni Turkic inhabitants. Shia Muslims were sold as slaves in Khotan. The Muslims of Xinjiang traded Shias as slaves. There is widespread violence and discrimination against Afghan Hazaras, who became an easy target for the Sunni extremists due to their distinct features. Abdur Rahman Khan is responsible for hundreds of thousands of Afghan Shia deaths. Nowadays, Hazaras are regularly targeted by the Taliban or ISIS. They also face discriminatory policies from the Sunni dominated, central government in Kabul, such as lack of proper protection or underfunding of their majority regions. There is limited violence against Shias in Bangladesh. For example, on October 24, 2015 a Shia mosque was blasted while 1 died and many injured as well. Another most widely discussed attack took place at Haripur in Shibganj in Bogra. The Muazzin was shot dead in the Shiite mosque and at least four men including the Imam were injured while Magrib prayer was going on. A majority of Bahrain's population are Shia, with figures between 70-75% people. The ruling Al Khalifa family, who are Sunni Muslim, arrived in Bahrain from Qatar at the end of the eighteenth century. Shiites alleged that the Al Khalifa failed to gain legitimacy in Bahrain and established a system of "political apartheid based on racial, sectarian, and tribal discrimination." Vali Nasr, a leading Iranian expert on Middle East and Islamic world said "For Shi'ites, Sunni rule has been like living under apartheid". An estimated 1000 Bahrainis have been detained since the 2011 uprising and Bahraini and international human rights groups have documented hundreds of cases of torture and abuse of Shia detainees. According to csmonitor.org, the government has gone beyond the crushing of political dissent to what "appears" to be an attempt to "psychologically humiliating the island's Shiite majority into silent submission." Discrimination against Shia Muslims in Bahrain is severe and systematic enough for a number of sources (Time magazine, Vali Nasr, Yitzhak Nakash, Counterpunch, Bahrain Centre for Human Rights, etc.) to have used the term “apartheid” in describing it. after the dismantling of the apartheid regime in South Africa, Bahrain remained the only country where a minority dictated terms to a majority. More than 70 percent of the Bahrainis are Shiite Muslims, but they have little or no say in the government. a form of sectarian apartheid by not allowing Shiites to hold key government posts or serve in the police or military. In fact, the security forces are staffed by Sunnis from Syria, Pakistan, and Baluchistan who also get fast-tracked to Bahraini citizenship, much to the displeasure of the indigenous Shiite population. While Shia activists claim the number exceeds one million, the Salafists say there are only a few thousand. Estimated numbers of Egypt's Shias range from 800,000 to about two to three million. According to Brian Whitaker, in Egypt, the small Shia population is harassed by the authorities and treated with suspicion, being arrested – ostensibly for security reasons –- but then being subjected to torrents of abuse by state security officers for their religious beliefs. For decades, international organisations, including the UN, Human Rights Watch and Amnesty International, have documented instances in which Egyptian Shias have been targeted for their religious beliefs. A December 2012 report by UN refugee agency UNHCR highlighted the fact that Shias still cannot openly practice their religious rituals in Egypt. Hassiba Hadj Sahraoui told the UNHCR that many groups were being prosecuted for alleged 'blasphemy'. US Commission on International Religious Freedom continues to label Egypt as a "country of particular concern" in terms of systematic violations of religious freedom. In December 2011, Egyptian security forces prevented hundreds of Shias from observing Ashura religious celebrations in Cairo's El-Hussein Mosque, a Shia holy site. Police forcibly removed the Shia worshippers from the mosque after Salafi groups accused them of performing barbaric rituals. On December 29, 2011 in Nangkrenang, Sampang, Madura Island a Shia Islamic boarding school, a school adviser's house and a school's principal house were burned by local villagers and people from outside. Indonesia is the most populous Muslim country in the world which is dominated by Sunnis. A day after the incident, a Jakarta Sunni preacher said: "It was their own fault. They have established a pesantren (Islamic school) in a Sunni area. Besides, being a Shiite is a big mistake. The true teaching is Sunni and God will only accept Sunni Muslims. If the Shiites want to live in peace, they have to repent and convert." Amnesty International had recorded many cases of intimidation and violence against religious minorities in Indonesia by radical Islamic groups and urged the Indonesian government to provide protection for hundred of Shiites who have been forced to return to their village in East Java. The ISA was used on several occasions to target Shi‘a in Malaysia. Ten Shi‘a were arrested in 1997 under the ISA and another six suffered the same fate in October 2000. The federal system has also meant that adherence to the anti-Shi‘a fatwa has not been standardized, even among those states in which it carries legal force. In December 2010, for example, 200 Shi‘a were arrested by the Selangor Islamic Religious Department for celebrating ashura under the Selangor state shari‘a criminal enactment law. Four years later, 114 Shi‘a were arrested by the Perak Islamic Religious Affairs Department with assistance from the Malaysian police. Despite the fact that the country was founded as a secular state, Shia Muslim civilians were victims of unprovoked hate since the beginning, with the “Islamisation” in the 1980’s, Pakistan has been seeing a surge in violence against Shia Muslims in the country in recent decades. Over 1,900 Shias (including Hazaras and Ismailis) were killed in bomb blasts or targeted gun attacks from 2012 to May 2015 alone. The violence has claimed lives of thousands of men, women and children. Shia make up 20% of the Muslim population in Pakistan. Doctors, businessmen and other professionals have been targeted in Karachi by Sunni militants on a regular basis. Hazara people in Quetta, have lost nearly 8000 community members. Most have been targeted by terrorist attacks by Lashkar-e-Jhangvi and Sipah-e-Sahaba Pakistan which are a Sunni militant organizations affiliated with Al-Qaeda and Taliban. In the northern areas of Pakistan, such as Parachinar and Gilgit-Baltistan, Sunni militants have continuously been attacking and killing Shia Muslim civilians. On August 16, 2012, some 25 Shia passengers were pulled out of four buses on Babusar road, when they were going home to celebrate Eid with their families. They were summarily executed by Al-Qaeda affiliated Sunni Muslim militants. On the same day, three Hazara community members were shot dead in Pakistan's southwestern town of Quetta. Sunni extremists, aligned with Al-Qaeda and the Taliban, yearly are killing Shia civilians by the hundreds in Pakistan. The sole purpose of terrorists such as Sipah-e-Sahaba Pakistan is to cleanse Pakistan of Shia Muslims. On 26 June 2018, government of Pakistan lifted ban on Sipah-e-Sahaba Pakistan, unfroze its assets and removed its notorious leader from terrorist watch list. In modern-day Saudi Arabia, the Wahhabi rulers limit Shia political participation to a few notable people. These notables benefit from their ties to power and in turn, are expected to control their community. Saudi Shias comprise roughly 15% of the 28 million Saudis (estimate 2012). Although some live in Medina (known as the Nakhawila), Mecca, and even Riyadh, the majority are concentrated in the oases of al-Hasa and Qatif in the oil-rich areas of the Eastern Province. They have faced long-term religious and economic discrimination. They have usually been denounced as heretics, traitors, and non-Muslims. Shias were accused of sabotage, most notably for bombing oil pipelines in 1988. A number of Shias have been executed. In response to Iran's militancy, the Saudi government collectively punished the Shia community in Saudi Arabia by placing restrictions on their freedoms and marginalizing them economically. The ulama (who adhere to Salafism) were given permission to sanction violence against the Shia. What followed were fatwas passed by the country's leading cleric, Abd al-Aziz ibn Baz which denounced the Shias as apostates. Another by Adul-Rahman al-Jibrin, a member of the Higher Council of Ulama even sanctioned the killing of Shias. This call was reiterated in Salafi religious literature as late as 2002. Unlike Iraq and Lebanon which have a sizable number of wealthy Shia, Saudi Arabia does not. There have been no Shia cabinet ministers. They are kept out of critical jobs in the armed forces and the security services. There are no Shia mayors or police chiefs, and none of the three hundred Shia girls’ schools in the Eastern Province have a Shia principal. The government has restricted the names that Shias can use for their children in an attempt to discourage them from showing their identity. Saudi textbooks are hostile to Shiism often characterizing the faith as a form of heresy. Salafi teachers frequently tell classrooms full of young Shia schoolchildren that they are heretics. In the city of Dammam, a quarter of whose residents are Shia, Ashura is banned, and there is no distinctly Shia call to prayer. There is no Shia cemetery for the nearly 25% of the 600,000 Shias that live there. 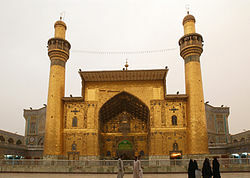 There is only one mosque for the city's 150,000 Shias. The Saudi government has often been viewed as an active oppressor of Shias because of the funding of the Wahhabi ideology which denounces the Shia faith. In March 2011, police opened fire on peaceful protesters in Qatif, and after Shia unrest in October 2011 the Saudi government promised to crush any further trouble in the eastern province with an "iron fist." Saudi Arabia continues its anti-Shia campaign both domestically and abroad. According to the Independent, "Satellite television, internet, YouTube and Twitter content, frequently emanating from or financed by oil states in the Arabian peninsula, are at the centre of a campaign to spread sectarian hatred to every corner of the Muslim world, including places where Shia are a vulnerable minority, such as Libya, Tunisia, Egypt and Malaysia." The Saudi regime is also acutely aware that, in the final analysis, the Shiite grievances are not merely doctrinal issues but stem from socioeconomic deprivation, as a result of religious repression and political marginalization bordering on apartheid. In January 2016, Saudi Arabia executed the prominent Shiite cleric Sheikh Nimr, who had called for pro-democracy demonstrations, along with 47 other Saudi citizens sentenced by the Specialized Criminal Court on terrorism charges. Since May 2017 in response to protests against the government, the predominantly Shia town of Al-Awamiyah has been put under full siege by the Saudi military. Residents are not allowed to enter or leave, and military indiscriminately shells the neighborhoods with airstrikes, mortar and artillery fire along with snipers shooting residents. Dozens of Shia civilians were killed, includinga a three year old and a two year-old children. The Saudi government claims it is fighting terrorists in al-Awamiyah. Residents also reported soldiers shooting at homes, cars and everyone in streets. During the crackdown the Saudi government demolished several historical sites and many other buildings and houses in Qatif. On July 26, 2017, Saudi authorities began refusing to give emergency services to wounded civilians. Saudi Arabia has also not provided humanitarian help to trapped citizens of Awamiyah. In August 2017, it was reported that the Saudi government demolished 488 buildings in Awamiyah. This demolition came from a siege of the city by the Saudi government, as it continued to try to prevent the citizens of the city from gaining their rights. 20,000 residents were forced to flee from their homes to survive. President of Quran Council and two cousins of executed Nimr al-Nimr were also killed by Saudi security forces in Qatif in 2017. In February 2019, while visiting Prophet’s grave in Medina, a six years old boy was beheaded in front of his mother after they confirmed to be Saudi Shia Muslims to an unknown, unrelated man that approached them. The boy was beheaded with the help of broken piece of glass in front of his screaming and frightened mother. ^ "Anti-Shi'ism". Shia Rights Watch. Retrieved 11 December 2012. ^ Kedourie, Elie (April 1988). "Anti-Shi'ism in Iraq under the Monarchy". Middle Eastern Studies. 24 (2): 249–253. doi:10.1080/00263208808700740. ^ Nasr, Vali (2006). The Shia Revival: How Conflicts Within Islam Will Shape the Future. W.W. Norton & Company Inc. ISBN 978-0-393-06211-3 pp. 52-53. ^ "Shias of Kashmir – Socio Political Dilemmas". Kashmir Observer. Retrieved 2010-07-01. ^ "Shias of Kashmir: Socio-Political Dilemmas". Kashmir Observer. ^ "Clashes in Jammu and Kashmir over Muharram procession ban". The Asian Age. Archived from the original on 2014-12-24. ^ Ildikó Bellér-Hann (2007). Situating the Uyghurs between China and Central Asia. Ashgate Publishing, Ltd. p. 20. ISBN 0-7546-7041-4. Retrieved 2010-07-30. ^ Ildikó Bellér-Hann (2008). Community matters in Xinjiang, 1880-1949: towards a historical anthropology of the Uyghur. BRILL. p. 138. ISBN 90-04-16675-0. Retrieved 28 December 2010. ^ "Religion and Politics in Bahrain: Facts on the Ground: A Reliable Estimate of Bahrain's Sunni-Shi'i Balance, and Evidence of Demographic Engineering". bahrainipolitics.blogspot.co.uk. Retrieved 2016-03-02. ^ Nakash, Yitzhak (2006). Reaching for Power: The Shi'a in the Modern Arab World (PDF). Princeton University Press. p. 24. ^ Bobby Ghosh (5 March 2007). "Behind the Sunni-Shi'ite Divide". Time magazine. Retrieved 18 March 2012. ^ Aryn Baker  "Why A Saudi Intervention into Bahrain Won't End the Protests" March 14, 2011, Time Magazine. ^ Franklin Lamb "Archived copy". Archived from the original on 2011-06-23. Retrieved 2011-10-08. CS1 maint: Archived copy as title (link) " The Obama Doctrine: AWOL in Bahrain," April 15–17, 2011, CounterPunch. ^ Raymond Barrett  "Bahrain emerging as flashpoint in Middle East unrest," Feb. 15, 2011, Christian Science Monitor. ^ Zeinab El-Gundy (18 Mar 2013). "The Shias: Egypt's forgotten Muslim minority". Ahram Online. Retrieved 29 July 2013. ^ Col. (ret.) Dr. Jacques Neriah (September 23, 2012). "Egypt's Shiite Minority: Between the Egyptian Hammer and the Iranian Anvil". JCPA. ^ Cam McGrath (Apr 26, 2013). "Spring Brings Worse for Shias". Cairo. Inter Press Service News Agency. Retrieved 29 July 2013. ^ Tim Marshall (25 June 2013). "Egypt: Attack On Shia Comes At Dangerous Time". Sky News. Retrieved 29 July 2013. ^ "Shia Islamic boarding school attacked in Madura". December 29, 2011. ^ "Arson of Shiite 'pesantren', illiteracy and local leaders". December 31, 2011. ^ "Amnesty Int`l urges RI to protect Shiite minority". January 14, 2012. ^ "16 arrested for spreading Shia teachings, says minister - Bernama". themalaysianinsider.com. Archived from the original on 2013-11-10. ^ Roul, Animesh (June 26, 2015). "Growing Islamic State Influence in Pakistan Fuels Sectarian Violence". Terrorism Monitor. 13 (13). Retrieved 30 June 2015. ^ "Country Profile: Pakistan" (PDF). Library of Congress Country Studies on Pakistan. Library of Congress. February 2005. Retrieved 2010-09-01. Religion: The overwhelming majority of the population (96.3 percent) is Muslim, of whom approximately 95 percent are Sunni and 5 percent Shia. ^ "Religions: Muslim 95% (Sunni 75%, Shia 20%), other". Pakistan (includes Christian and Hindu) 5%. The World Factbook. CIA. 2010. Retrieved 2010-08-28. ^ "Govt lifts ban on ASWJ, unfreezes assets of its chief Ahmed Ludhianvi". The Express Tribune. 27 June 2018. Retrieved 11 January 2019. ^ "Pakistan removes ASWJ leader Ahmed Ludhianvi from terrorist watchlist". Samaa TV. Retrieved 11 January 2019. ^ Patrick Cockburn (December 29, 2013). "Sunni monarchs back YouTube hate preachers: Anti-Shia propaganda threatens a sectarian civil war which will engulf the entire Muslim world". Independent. ^ Patrick Bascio(2007). Defeating Islamic Terrorism: An Alternative Strategy. Branden Books. p. 60. ISBN 978-0-8283-2152-5. . Retrieved March 6, 2010. ^ ABNA24 (31 July 2017). "ABWA's satement on condemnation of Al Saud's crimes in Awamiyah". ^ ABNA24, PressTV, (26 July 2017). "Saudi forces shell homes in Awamiyah, Two killed / Video & Pics". ^ "Snipers Injure Scores of Civilians in Saudi Arabia's Qatif". 14 June 2017. ^ "PressTV-Saudi forces shot dead youth in restive Qatif". ^ "PressTV-Saudi regime offensive on Shia town enters week 2". ^ "'You might get shot any time': Saudi forces raid Shia town as Riyadh welcomes Trump". ^ "PressTV-Saudi forces kill toddler, young man in Qatif". ^ "Saudi Forces Raid Al-Masoura in Awamiyah, Open Fire, Destroy Houses". ^ Editorial, Reuters. "U.N. slams erasing of "cultural heritage" in Saudi Arabia". ^ "PressTV- Saudi forces intensify attacks on Shia town". ^ "PressTV-'Riyadh erasing cultural heritage in Shia town'". ^ "Al-Musawara neighborhood totally destroyed, Saudi Arabia says". Shiite News. Retrieved 18 August 2017. ^ "Saudi Arabia demolishes 500 residential buildings in Awamiya". Shiite News. Retrieved 18 August 2017. ^ "PressTV-Saudi forces kill head of Quran council in Qatif". ^ "Saudi regime forces kill Sheikh Nimr's cousins in Qatif: Report". ^ "PressTV-'Saudi forces kill Nimr's cousins in Qatif'". Look up Shiaphobia or Shiaphobe in Wiktionary, the free dictionary.